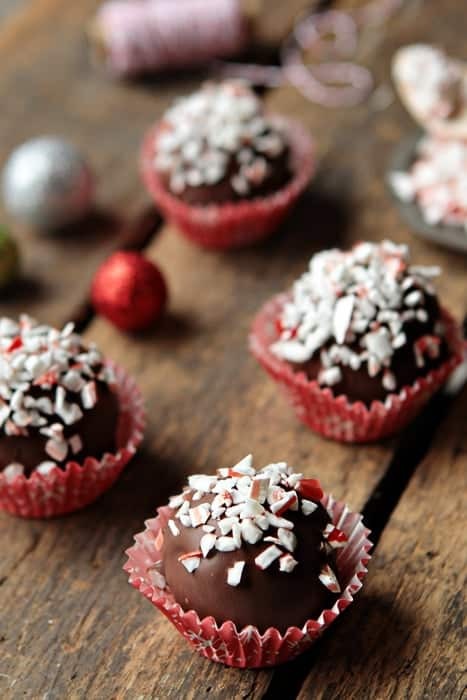 Oreo cookies combine with Peppermint Mocha Kahlua and peppermint bark to create festive and delicious Oreo Cookie Balls. If you follow MBA on Facebook, you know that I’m pretty much obsessed with all things chocolate-peppermint right now. From Dark Chocolate Candy Brownies and Crème de Menthe Stuffed Chocolate Cookies to Peppermint Kahlua Truffles – this girl has chocolate-peppermint issues. Our candy dish is brimming with Hershey’s Candy Cane Kisses (yes, I totally bought that ginormous bag) and Ghiradelli Peppermint Bark Squares. I could definitely take the easy way out and blame being pregnant or Eric, but I’m completely cool with being a peppermint candy hoarder. And truth be told, Eric’s not all that into the chocolate-peppermint combo – which means more for me (insert greedy laugh here)! When the lovely folks at Oreo asked me to create a festive Oreo Cookie Ball recipe for the holidays, I knew exactly what to make. Obviously, I’ve been hoarding more than my share of peppermint-chocolate things, so I decided it was time to make something for everyone else to enjoy. 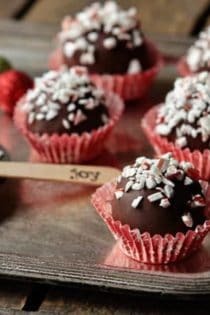 Peppermint Kahlua Oreo Cookie Balls full of boozy goodness (which also ensures I wouldn’t be tempted to eat my weight in them). They’re incredibly simple and full of peppermint flavor which makes them the perfect addition to any holiday party or cookie tray. I’m thinking Santa might totally dig these as well! Or your Secret Santa. Pretty much anyone that needs chocolate, peppermint, and a little boozy goodness in their holiday. 1. In the bowl of a food processor, pulse the Oreo cookies until finely crushed. Add in cream cheese and Peppermint Mocha Kahlua and pulse until combined. 2. Remove Oreo mixture to a medium bowl. Mix in finely chopped peppermint bark until evenly distributed. 3. Shape into 48 (1-inch) balls. Freeze balls for 10 minutes. Dip balls in melted chocolate; place in single layer in shallow waxed paper-lined pan. If desired, sprinkle with crushed candy. Refrigerate for 1 hour or until firm. 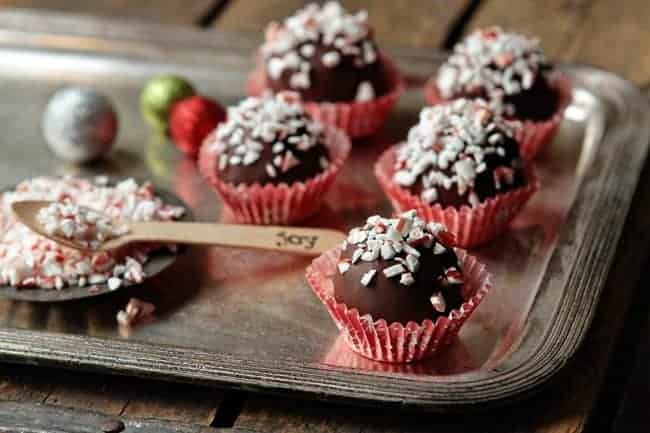 - Peppermint Oreo Balls are just as amazing without the Kahlua, so if you don't have any on hand, or you're not fond of alcohol, simply omit it. Disclosure: My Baking Addiction has teamed up with Oreo to develop an Oreo Cookie Ball recipe for a sponsored post. All opinions are my own. The links above are provided for your reference and several are from My Baking Addiction’s Amazon affiliate account. If items are purchased via these Amazon links, My Baking Addiction will receive a small commission. These sound soooo good!! Loving the flavour! Do you use the entire oreo or just the chocolate poritons? Thanks. You use the entire Oreo. I hope this helps! Thanks so much for stopping by, Hari! Great idea to add in the kahlua! I bet these are spectacular! Can I use chopped up candy canes in place of the peppermint bark ? I’ve never used peppermint bark before. That should be fine, Lizbeth. Peppermint Bark is simply chocolate and candy canes together anyway. If you leave out the kahlua doesnt it lose its pepermint flavour? Should i use 1 teaspoon of pepermint extract instead or more/less? I’m also gonna use candy canes instead of the bark. You could substitute the Kahlua for peppermint extract and I think 1 teaspoon would be about right. I hope this helps! Should they remain refrigerated? Gifting so not sure if they can remain out with the cream cheese? Yes, I recommend keeping them refrigerated. I hope this helps and I apologize for the super delayed response, a bunch of valid comments ended up in spam and I am just getting around to retrieving and responding to them. Have a great day.